The Tallit (or Tallis-ashkenazi) is worn as a reminder to observe all G-d's laws and thereby achieve holiness. A Tallit sets the tone of your prayer. Kabbalists speak of the Tallit as a special gown that inspires awe and reverence during prayer. Ritual fringes, called Tzitzit are attached to each of the four corners of the Tallit in accordance with biblical law, so that the wearer will "look at these fringes and recall G-d's Commandents". The Atarah, (Hebrew for crown) or collar, is usually inscribed with the prayer that is recited just before you put on the Tallit. The purpose of the Atarah is to distinguish top verses bottom of the Talit, and uniformity of putting on the Tallit, thus another way of respect is observed. 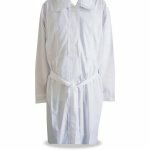 GoldenDreidle.com offers a wide range of Traditional Tallit Sets, Bar Miztvah Tallit Sets, Full Size Tallits, Bat Miztvah and Ladies Tallits. Most Tallit and Tallitot come from Israel but we also love to feature talented artists from the United States as well. The law requiring the wearing of Talitot, (plural for tallit) comes from Numbers 15:37-41. G-d said to Moses, "Speak to the Choldren of Israel and bid them to affix fringes to the corners of their garments.... that we may look upon them and remember all the commandments of the Lord". GoldenDreidle.com offers a large selection of ladies Beaded Wire Kippahs that coordinate with the many beautiful Tallits for Ladies or Bat Mitzvah. These Beaded Wire Kippahs are handmade and truly works of art that will be the finishing touch. On the High Holy Days it is traditional to wear an all white Tallit, symbolizing purity, to focus on our prayers and not vanity.